The World Hepatitis Day is observed to increase the awareness and understanding of hepatitis B, hepatitis C and the diseases that they cause. 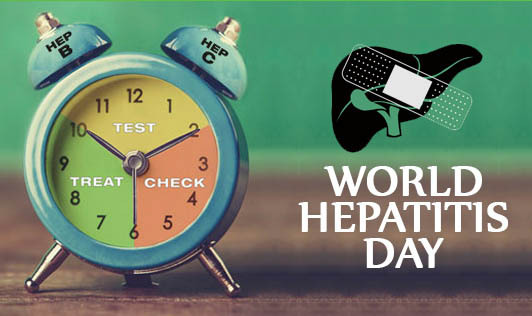 This year, the world hepatitis day falls on July 28th. Hepatitis is an inflammation of the liver, most commonly caused by a viral infection. There are five main hepatitis viruses, referred to as types A, B, C, D and E. These are of great concern because of the burden of illness and death they cause and the potential for outbreaks and epidemic spread. According to the WHO, types B and C lead a major global health risk with around 350 million people being chronically infected with hepatitis B and around 170 million people being chronically infected with hepatitis C.
Hepatitis A and E are typically caused by ingestion of contaminated food or water. Hepatitis B, C and D usually occur as a result of parenteral contact with infected body fluids. Common modes of transmission for the viruses include receiving contaminated blood or blood products, invasive medical procedures using contaminated equipment and for hepatitis B transmission from mother to baby at birth and also by sexual contact. Chronic infection leads to non-specific symptoms such as malaise, tiredness and weakness, and often leads to no symptoms at all. It is commonly identified on blood tests performed either during screening or while evaluating non-specific symptoms. Bed rest, abstaining from alcohol, and taking medication to help relieve symptoms. Most people who have hepatitis A and E get well on their own after a few weeks. Hepatitis B and C are treated with drugs. Also your doctor will discuss possible treatments, depending on the cause of the liver disease. Hepatitis A: Immunization of children (1-18 years of age) consists of two or three doses of the vaccine. Adults need a booster dose six to 12 months following the initial dose of vaccine. The vaccine is effective for 15-20 years or more. Hepatitis B: Safe and effective vaccines provide protection against hepatitis B for 15 years and possibly much longer. Wash your hands after going to the bathroom and before fixing food or eating. Use condoms, which may lower the risk of transmission. Avoid tap water when travelling to certain countries or regions. Don't share personal items-such as toothbrushes, razors and nail clippers-with an infected person. Avoid drugs and medicines with alcohol. Avoid environmental pollutants such as paint thinners, bug sprays and aerosol fumes.